You are currently browsing the tag archive for the ‘baby’ tag. I’ll never forget the day that I wrote the cheque for my NCT Class. Two-hundred-and-how-much to sit in a stuffy sports centre conference room with a bunch of other nervy first-timers sporting enormous bumps, and their quivering husbands, who all did something in IT? Like every other vaguely middle-class mother, I had heard the stories about NCT Classes, both the good and bad. The good involved making friendships that lasted a lifetime, and learning the right way to do your ‘kegels’, so post-birth your pelvic floor muscles didn’t permanently collapse and die. Some said you even got the occasional tip on good positions to give birth in, and what type of pain relief to go for on the big day (meant to be the real point, but everybody knows that’s just a cover-up). The bad stories involved feeling overwhelmingly pressurised into having a natural birth and breastfeeding till age four, and rejecting taking anything more than a paracetomol and a spritz of Rescue Remedy on the big day. And that the group would consist of aggressively competitive, Boden-sporting women who all lived in bigger houses than you, and would spend the rest of you and your child’s days making you feel miserably inferior about the fact that your baby reached every single milestone later than theirs did (weaning, walking, talking, getting into the right nursery, signing up to a major league junior football team, the whole shebang). As with most things in life, the reality was neither one thing or the other. No, I didn’t meet 11 like-minded soulmates who I’ll share my darkest secrets with till the grave, but most of the women were reassuringly uncompetitive and actually rather nice. During the actual lessons, I remember doing something alarming with a bucket (don’t ask), learning how to ‘breathe’ (which I naturally forgot the instant I went into labour) and listening agog while our teacher held court and described what it was like to eat her friend’s placenta at a dinner party. But otherwise it was OK (though worth £250? Still not sure if I’d have been better off buying a Nintendo Wii). Like most women, my main motivation for going was simple though. It was, quite simply, an opportunity to meet other women at a similar stage in pregnancy – I feared that if I didn’t go, after having my baby I would sit at home alone, friendless and isolated, up to my elbows in baby poo and crying in front of Homes Under The Hammer , my single opportunity to meet other local mothers permanently squandered. For this reason, my main source of stress initially was signing up to the right class for my area – neither one that I was offered was particularly close to my house, and in the end very few of the people in my class lived in my immediate area anyway (and some of the ones that did moved away). In the months that followed I realised that it wouldn’t really have mattered if I hadn’t gone, though. Most of the birth stuff covered was in the books I’d already read, online or in a not-dissimilar-but-free NHS class I attended (though this one was in a bleak chamber above a doctors’ waiting room, noone said a word to each other and the nurse who hosted it seemed to be intent on terrifying us new-mothers-to-be into early labour, by passing around an assortment of different sized forceps and, also, a catheter. (I also seem to remember a frighteningly bloody video of childbirth, not unlike one I’d seen at school 20 years earlier which made me vow never to have children for about the next 15 years). Anyway, after having my son, I met another post-natal group – for free! – who were friendly, reassuring and nice and and who became as much ‘my’ group as the one I spent a small fortune on. But then, I guess, I’d never have heard that story about the placenta. I never bought a microwave oven until I was pregnant. For years I resisted, for, I admit, partly irrational reasons. Leaky radiation frying my brain every time I pinged a ready meal. Soggy vegetables. Baked potatoes with sad, floppy skins. Hotspots that took off the roof of your mouth, next to other spots that were still frozen and raw. The fact that they annihilated all those lovely vitamins (like the radiation worries, now apparently disproven). More than anything, the fact it was yet another unlovely gadget to take up valuable worktop space. But I finally relented, and boy have I not looked back. While the main oven is obviously the main source for proper nice grub (I’m not a complete food heathen), the microwave is undoubtedly handy when you have a baby. Yes, OK, I’m talking mainly making Ready Brek. But not just that. 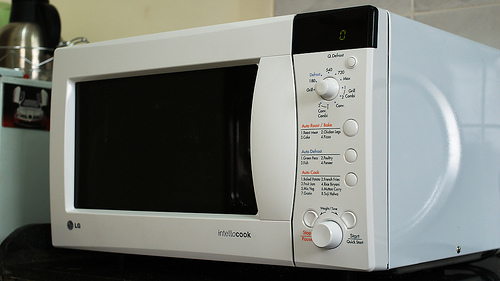 When your baby is howling his or her head off, a microwave requires one dish, two minutes and a button to defrost some bread, to cook some broccoli or some sweet potato, to heat up yesterdays leftovers, or poach a piece of salmon. It won’t get you on the shortlist for Masterchef. But it might just save your sanity. And as I’m far as I’m concerned, that’s better than an Aga.